While I don’t feel guilty ordering in once in a while, sourcing our dinner out to Seamless or Postmates had become less of an occasional treat, and more of a hanger-driven two-to-three-nights-a-week rut*. Expensive, lazy, and not particularly healthy, this bad habit was putting a small, but not insignificant strain on our mental and physical well-being. *Our situation was nowhere near this extreme, but still. Obviously, I love to cook — it is what I do for a living after all — but finding the time to make dinner doesn’t always come easily. In our case (and I suspect, for many other folks) the main hurdle to overcome was finding the time to grocery shop. (Generally speaking, I find that if I have a plan and the ingredients on hand, the rest follows.) With that in mind, I’ve been trying out a variety of meal kit services, including FreshRealm, Terra’s Kitchen, and Martha & Marley Spoon. For the most part, I’ve been quite impressed with these services. I could go on and on about their pros and cons, but the short version is that they can be an effective tool; a clever meal planning aid. I don’t think we’ll use one of these services in the long run, but it has been a helpful push in the right direction towards developing better habits: cooking more and ordering delivery less, a reset button, if you will. And, (crucially) the recipes themselves have been consistently solid across the board. If you could use some meal-planning help, I absolutely recommend testing the waters yourself. 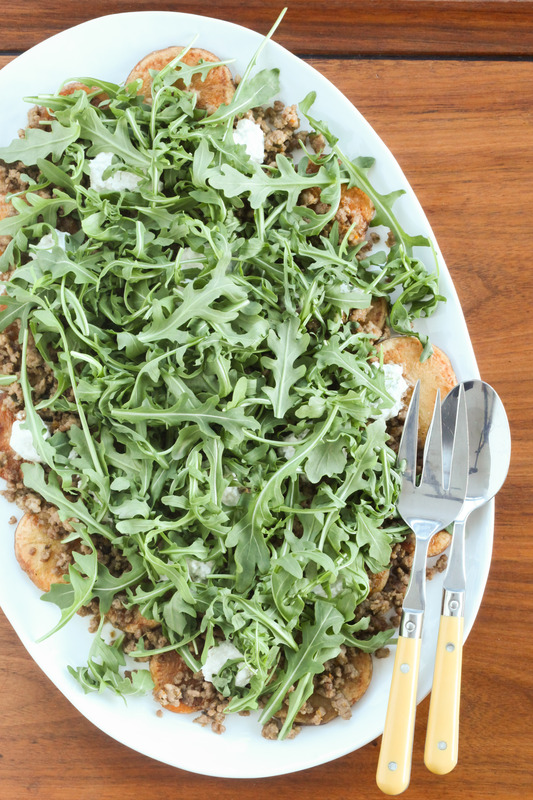 Here, I’m sharing a recipe I discovered thanks to one of the aforementioned meal kits, specifically, a combination of roasted potatoes, fennel-and-coriander-spiced pork, feta, and arugula — a Mediterranean-inspired, not-quite-as-indulgent take on poutine — sourced from Martha & Marley Spoon. Cozy, hearty, and craveable, it is a dinner I look forward to making again. Toss the potatoes with 2 tablespoons oil and 1/2 teaspoon salt on a rimmed baking sheet. Spread out into a single layer and roast, without flipping, until slightly crispy and golden brown, 20–25 minutes. Meanwhile, crush fennel and coriander seeds with a meat mallet or heavy skillet. Zest half of the orange and juice the whole orange into a small bowl. Heat 2 tablespoons oil in a medium skillet over medium-high heat. Add the crushed fennel and coriander seeds and cook until fragrant, about 1 minute. Add garlic and cook, stirring, until lightly golden, about 1 minute. Stir in ground pork and 1/4 teaspoon salt and cook, stirring occasionally, until crispy and browned, 6–8 minutes. Add the orange zest and juice, vinegar, dried oregano, and 1/2 cup water. Bring to a simmer and cook, stirring occasionally, until almost all the liquid is evaporated, 5–7 minutes. Adjust to taste with more salt, if needed. Meanwhile, add the feta to a medium bowl and mash with a fork. Add 3 tablespoons water and a few grinds of pepper and whisk until creamy. 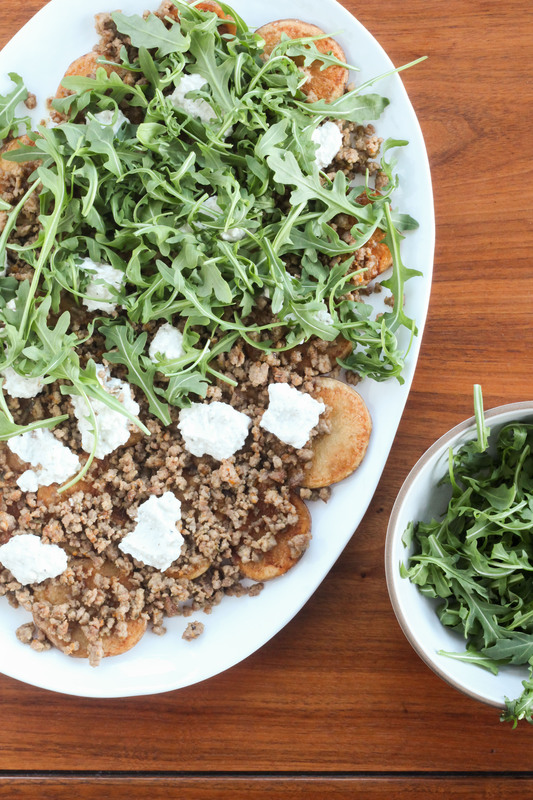 To assemble: Arrange the potatoes on a platter and top with pork, feta sauce, and arugula; drizzle with olive oil. For best results, use a rich, creamy feta, like Valbreso.